The award-winning self-building clients for our barn conversion in south-western France have started to build the second phase of the internal timber structure in the historic stone building. This structure will support the upper level of the barn where the bedrooms will be located, as well as a balcony over the full-height interior space. Underneath, the large open kitchen will face the living space, hiding the utility rooms and the garage/workshop behind it. The construction is following our original detailed design (above), using a post-and-beam framework and lightweight timber I-beams, to create an internal timber structure that could be easily assembled by self-builders without lifing equipment. The large timber structure was also designed to stand independently of the stone walls and existing roof structure, so that minimum intervention would be required on the historic structure. Prior to construction, our design was checked by a French specialist in timber structure (Equation Bois, based in neighbouring town Périgueux), who worked with the clients and us to prepare the detailed specification of the structural elements. The first phase of this internal timber structure, completed recently, created a temporary accommodation space inside the barn for our clients, where they will live until the rest of the barn is converted. Later on, it will be used as a comfortable bedroom for their future Bed & Breakfast, with the main living-room for the house above it. You can follow the progress of the project on our clients' blog. 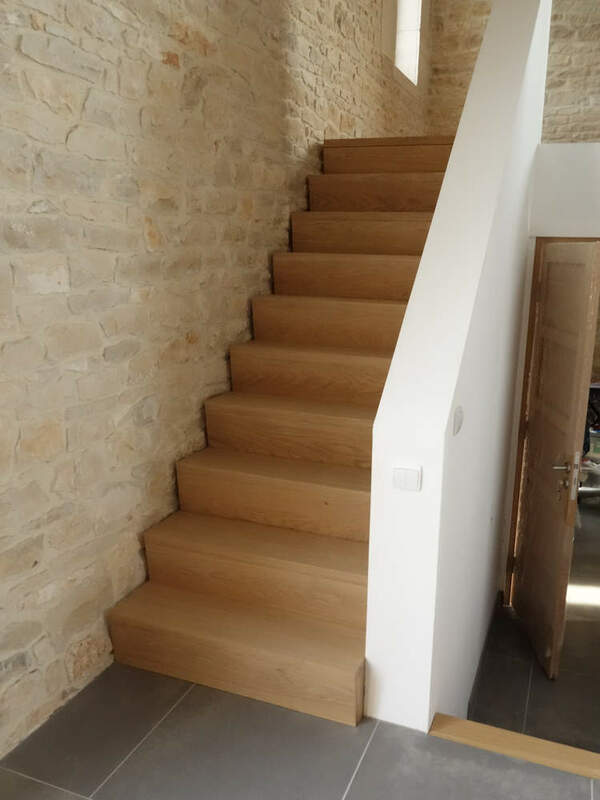 We were delighted when Mélanie and Béranger approached us to help them convert an old stone barn in south-west France into their new family home. This was the perfect project to combine our interests in sustainability, self-build construction and conservation. We worked closely with our clients to design a beautiful but affordable house, with a flexible layout and minimal environmental footprint. We brought together the different requirements of their family project, unveiling the stunning character of the 200 year-old stone building, while responding to the practical requirements of its new use. Our initial task was to carry out a detailed measured survey of the existing stone barn and a careful condition survey to establish the need for repair and conservation work, so that our new intervention could fit around and preserve the old wood and stone structure. This also helped us understand the key views, approaches and landscape requirements for this conversion project, to preserve and enhance its integration in the surrounding nature. We wanted to preserve what we experienced on our first visit to the original barn: an impressive feeling of spaciousness with a peaceful daylight filtering softly through the fallen roof tiles... This meant establishing a clear hierarchy of indoor spaces, so that the whole range of specific functions of the barn's new domestic use could be accommodated without overcrowding the attractive indoor volumes. The barn under construction: the new insulated roof and the repointed stone walls. The other challenge was to introduce natural daylight deep into a previously dark agricultural building. To respect the traditional architectural topology of the stone barn, we concentrated the new openings into few, larger light wells: they reflected off the light surface finishes and created contrasts between social spaces — opening up to the hight roof structure — and the more intimate private rooms. This also promoted effective natural ventilation across the barn in summer. We chose to keep as much as possible of the meter-thick stone walls in the interior, and insulated the new roof cover and floor slabs. Hovering within the stone volume is a secondary timber structure that weaves itself around the oak roof trusses, clearly identifying the new from the old and contrasting the textured historical materials with the contemporary new ones. Carefully balancing the client’s lifestyle choices, budget and aspirations, we designed and implemented design sustainability measures that we knew would work and could gracefully integrate with the historical building. This meant low-tech solutions with proven track record, that used resources readily available around the site. Making the most of the barn's extraordinary thermal mass, we incorporating radiant underfloor heating in the newly insulated floor slabs and connecting it to a central wood boiler, running on locally harvested wood logs. The vast roof was also ideal for rainwater collection, and the system we designed made the barn virtually independent for all water needs (including drinking water!). And while re-landscaping the surrounding agricultural land, we designed a complete waste treatment system based on reed-beds, a completely natural process that would purify all waste water from the family — and even transforming it into clean water for their new natural swimming pond! A key feature of this project is that the clients will manage the building process themselves, so we carefully phased the construction to make sure that the house would be comfortable and accommodating during the process, which may take years to complete. We also attentively considered the family’s cashflow over time, and their future aspirations and projects (the house will eventually double as a guesthouse). The different stages of the construction, each inhabitable and addressing the specific needs of the growing family (click to enlarge). So the new home is designed from the start into a series of stages that will evolve with the family, all the way from a space to park a caravan on the site! At each building stage, the plan and structural system work together to create comfortable habitable spaces, building in flexibility as the work progresses, so that later disruption can be avoided. We extensively used SketchUp to communicate with our self-building clients, providing them with updated detailed 3D model of the design. Since they had no former experience in carpentry, we also created a series of clear and user-friendly visualisations to explain how the different parts of the structure fitted together with simple assembling techniques and components that could be lifted and handled with limited equipment and muscle-power! Rewarding their amazing building skills and painstaking attention to details, our clients were even elected in 2012 Self-Builders of the Year by the French magazine Autoconstruction! The construction of the barn is still in on-going and our clients are sharing in details the day-by-day progress of this project and their self-building experience on their project blog. Thanks to 2hD for their outstanding work! The interior restoration of our two-century-old barn in southern France is almost completed, with all its stone walls repointed and the ceiling of the new insulated roof painted. Credits to our self-builder clients for their amazing work! The erection of the internal timber structure has also started. We planned the layout of the converted barn so that interior work could be organised in three independent phases: after this initial phase, our clients will be able to start inhabiting the barn, while continuing to work on the rest of the internal structure. Eventually, this first part of the structure will serve as a bedroom for their future guesthouse. We designed this self-supported structure to be easy to construct by the self-builder couple, without requiring any special equipment or tools. As our clients had no previous experience in carpentry, we produced a package of user-friendly construction drawings that clearly explained how things fitted together. After 122 bags of lime mortar and 8 months of hard work, Mélanie and Béranger, our self-builders in France, have completed the repointing of 200 sqm of stone wall in their converted barn in Dordogne! Beautiful result and a major achievement before starting to build the internal timber structure next month. Mélanie and Béranger have been working hard on their self-build barn conversion during these last months. After creating the new openings in the stone walls, installing the new roof and finishing all the groundwork, they are now getting ready to repoint the interior of the freshly cleaned stone walls with lime mortar. We are now finalising the detailed drawings for the internal timber structure while they manage the site themselves and do the hands-on building under their own steam. We are following their progress through their personal blog dedicated to the project. Our self-build barn conversion project in France is progressing well, with the new roof and floor slab now completed.